Rather than renew HH, I've decided to begin afresh. A new project of sorts. A daily meme for writing, not just haiku. You can, of course, write haiku on that topic there. Hope you join me there at A Prompt Each Day (http://aprompteachday.wordpress.com) which will have its first prompt on June the 1st, 2015. Posted by Vinay Leo R. at 8:09 PM 1 Poets Shared A Thought..
Any old HH-ers keeping a lookout here still? Been a while hasn't it? There's a possibility that HH might resume. A fresh start, clean slate, so to speak. 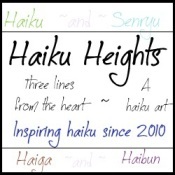 I've been asked by many, to consider restarting the Heights again, bring back the prompts. And today, I'm definitely considering it. The weekend approaches. Hopefully, will see a prompt up, and hopefully, will see some old poets back at it. Posted by Vinay Leo R. at 4:28 PM 7 Poets Shared A Thought..